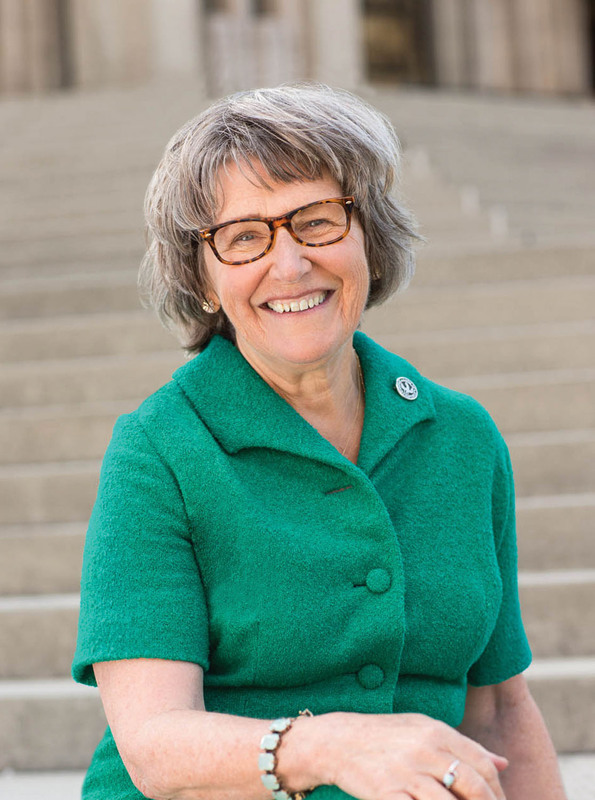 Sister Simone Campbell has served as Executive Director of NETWORK Lobby for Catholic Social Justice since 2004. She is a religious leader, attorney and poet with extensive experience in public policy and advocacy for systemic change. In Washington, she lobbies on issues that help “mend the gaps” in income and wealth in the U.S., focused specifically on how they disproportionately affect people of color and women. Around the country, she is a noted speaker and educator on these public policy issues. During the 2010 congressional debate about healthcare reform, she wrote the famous “nuns’ letter” supporting the reform bill and organized 59 leaders of Catholic Sisters, including the Leadership Conference of Women Religious (LCWR), to sign on. This action was cited by many as critically important in passing the Affordable Care Act. She was thanked by President Obama and invited to the ceremony celebrating its being signed into law. 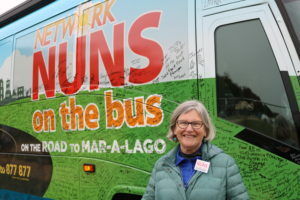 In 2012, she was also instrumental in organizing the first “Nuns on the Bus” tour to oppose the “Ryan Budget” approved by the House of Representatives. This budget would decimate programs meant to help people in need. “Nuns on the Bus” received an avalanche of attention across the nation from religious communities, elected officials and the media. 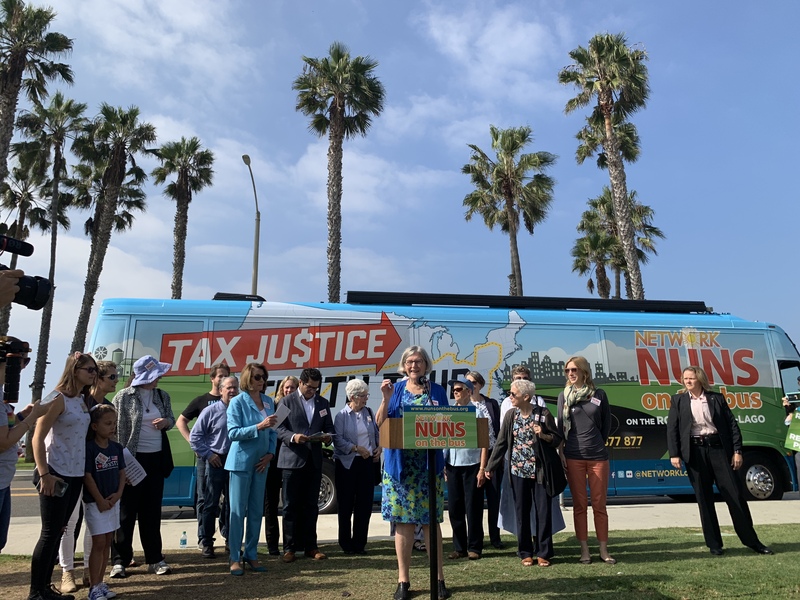 Since then, Sister Simone Campbell has led six cross-country “Nuns on the Bus” trips, focused on tax justice, healthcare, economic justice, comprehensive immigration reform, voter turnout, bridging divides in politics and society, and mending the gaps in wealth and access in our nation. The most recent tour, in the lead up to the 2018 midterm elections, visited 21 states to highlight the harmful impacts of the 2017 Republican Tax Law, ending with a “Fiesta for the Common Good” at President Trump’s Mar-a-Lago resort. Sister Simone has often been featured in the national and international media, including appearances on 60 Minutes, The Colbert Report, and The Daily Show with Jon Stewart. She has received numerous awards, including the “Franklin D. Roosevelt Four Freedoms Award” and the “Defender of Democracy Award” from the international Parliamentarians for Global Action. Additionally, she has been the keynote or featured speaker at numerous large gatherings, including the 2012 Democratic National Convention. Prior to coming to NETWORK, Simone served as the Executive Director of JERICHO, the California interfaith public policy organization that works like NETWORK to protect the interests of people living in poverty. Simone also participated in a delegation of religious leaders to Iraq in December 2002, just prior to the war, and was later (while at NETWORK) part of a Catholic Relief Services delegation to Lebanon and Syria to study the Iraqi refugee situation there. Before JERICHO, Simone served as the general director of her religious community, the Sisters of Social Service. She was the leader of her Sisters in the United States, Mexico, Taiwan and the Philippines. In this capacity, she negotiated with government and religious leaders in each of these countries. Follow Sister Simone on Twitter: @Sr_Simone. Download a shorter biography of Sister Simone.